Be accepted. Be supported. Be happy. We’re not your typical campus community. Samantha Cote ’19 noticed it right away: I was drawn to USF for it’s community. We all support and care for each other. There’s a sense of acceptance and freedom here. Whether you live on campus or commute, you will thrive in a community based on support and acceptance. You won’t be bored! We have more than 40 student clubs and organizations, a full schedule of student events and activities, leadership opportunities, and more. Your physical and emotional health are a top priority and we’ll give you the resources and support needed to be your best. USF students help make the world a better place. They complete more than 25,000 hours of service each year – locally, nationally, and internationally. You’ll have access to all types of support: academic, tutoring, disability services, & career development. There’s something for everyone. Whether you play on one of our 9 intramural teams or 18 NAIA teams, of if you just love the spirit of game day, fun is guaranteed. 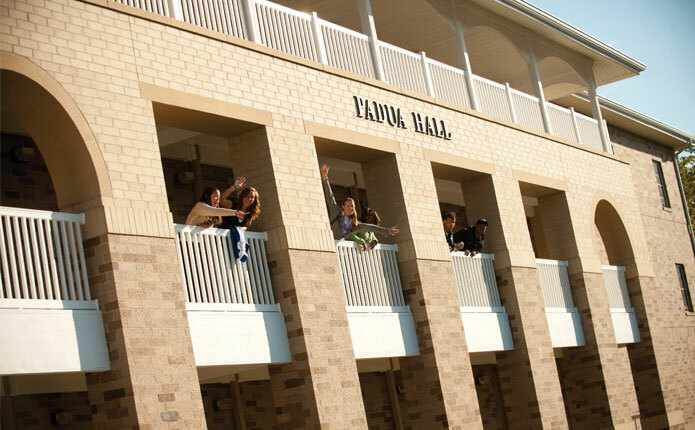 Life in the residence halls will give you all the comforts of home witha ton of friends! See our housing options: traditional, suite style, and apartments. What’s better than having your food prepared by our on-campus chef? Trinity Dining Hall offers home-style meals — always fresh, always delicious! Other campus dining options include Cougar Hideout and Starbucks. Plus, we have a variety of meal plan options for residential and commuter students.